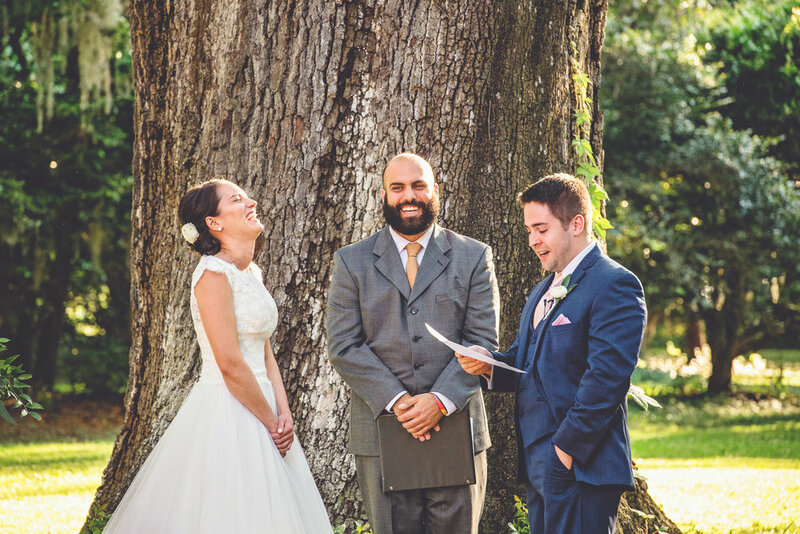 Getting married outside under ancient oak trees is a wedding wish we hear consistently at Palmetto State Weddings. And for good reason, as such a bucolic ceremony and reception site is both romantic and seriously Instagram-worthy. Even among the many picturesque oak groves of South Carolina, some stand out more than others. Few are as overwhelmingly beautiful as the oak allee at the Legare Waring House. This locale captured the imagination of Allison and Dave, who had been dreaming of a destination wedding spot that was special enough to ask their friends and family to join them. Their sunny spring wedding day turned out to be everything they'd hoped for and more, and they have every beautiful detail to cherish thanks to the beautiful photos from High Cotton Studios. Avid travelers, Allison and Dave initially considered eloping in one of the many cities they've visited. 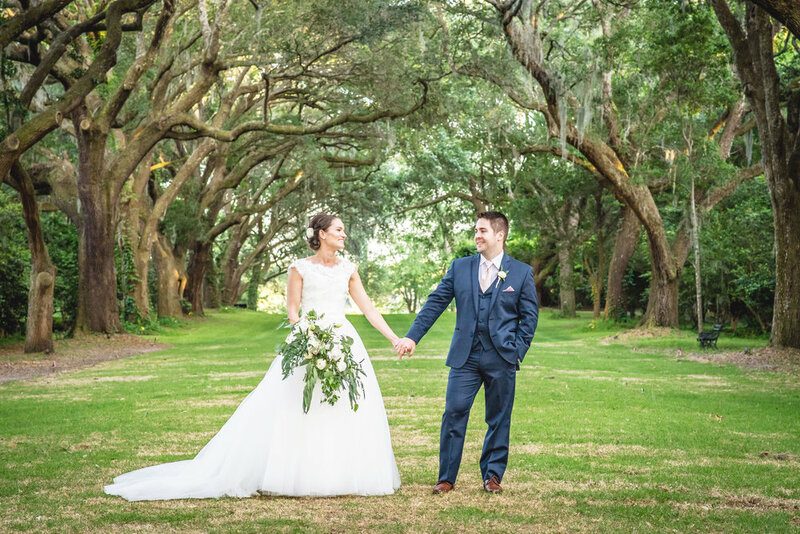 Says bride Allison, "We've spent the last few years going on travel adventures to explore different cities, cultures, food scenes, historical and natural areas all over the country and absolutely fell in love with Charleston." They considered escaping to their favorite Southern city for an intimate elopement but realized that just didn't feel right. "That lead us to thinking we couldn't get married without inviting all the special people of our lives and we realized we wanted to have a wedding in Charleston and hoped everyone could make the trip," recalls the bride. 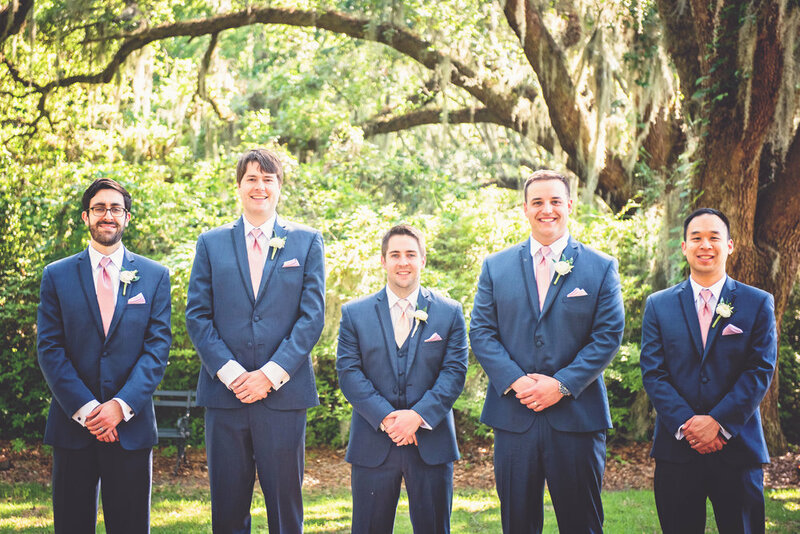 Before the couple knew it, they were joining their friends and family in the Holy City, where they kicked off the weekend with a welcome bash at 492 on King Street, then gathered again the next day at the beautiful Legare Waring House for the main event. 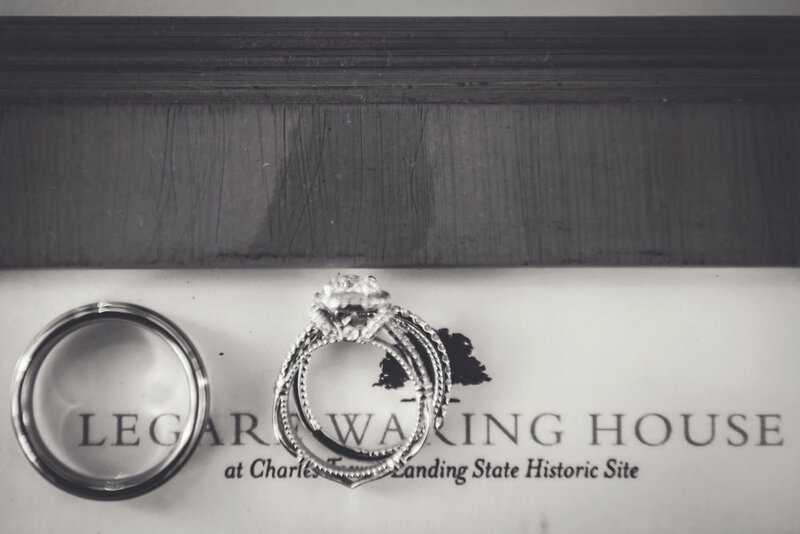 Located inside the Charlestowne Landing Historic Site, the Legare Waring (pronouned "Lee-gree Wear-ing") House is a breathtaking locale in West Ashley. The property, once a part of the Old Town Plantation, has been inhabited by Charleston settlers since the city's founding in 1670. The building that now plays hosts to weddings and events was once the overseer's house, as the main houses were destroyed by fire twice and not rebuilt. It was this history--and the oak allee leading to the home--that caught the eye of Allison and Dave while they were visiting. "We saw it in December and even during the off-season it was by far the most picturesque place we could have imagined to exchange our vows. 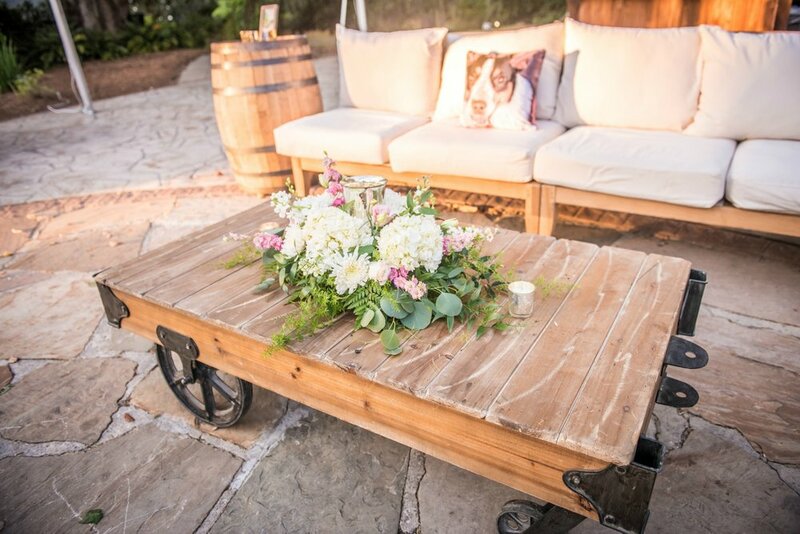 We wanted to enjoy the beauty of an outdoor garden space with ease of logistics and amenities to make the experience enjoyable for all, keeping the ceremony and reception in the same place," states Allison. Given that they wanted an outdoor ceremony, they also wanted to make sure that they had options if plans changed. They lucked up with a beautiful, sunny, and 75 degree day for their wedding day, but both Dave and Allison felt better in the planning process knowing that the house could accommodate their entire wedding if rain was in the forecast. 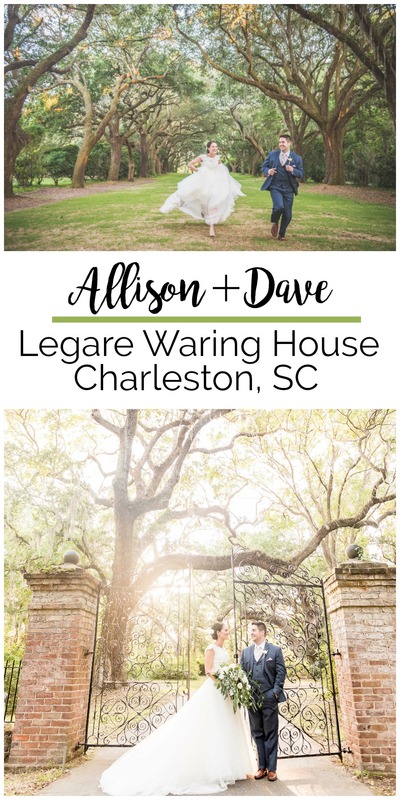 Beyond the stunning beauty of the place, the Legare Waring House covered all of the couple's needs to make their wedding day run smoothly. "The grounds offer so much versatility between each of the spaces for the day's events and capturing beautiful, memorable photos of our wedding day - the gorgeous iron gate entryway, avenue of oaks, wedding oak, lagoon, stone patio, and the beautiful historic home. We utilized each of the spaces for the ceremony, cocktail hour, reception, and our photographer did an amazing job with couple's photos in various parts of the grounds.The full catering kitchen and multiple, spacious areas for the bridal party to get ready on-site were a huge bonus," remembers Allison. Even though they were hosting a destination wedding, it was important for Allison and Dave to bring their family and friends into their big day as much as possible. Their officiant was a close friend, who set the perfect tone for the ceremony. "We gave him complete freedom to write from the heart," says the bride. "We couldn't have been happier with how the ceremony went, laughing, crying, and celebrating pure joy." Allison went through the day flanked with something old, something new, something borrowed, and something blue: but the most special of these was the baby bonnet that her mother-in-law gifted her shortly before the wedding. That bonnet had been worn home from the hospital by groom Dave, and Allison pinned it to the inside of her wedding dress for a sweet reminder of the history that both were bringing together that day. Once the ceremony was completed, Allison and Dave had a surprise for their guests: a customized, choreographed first dance! 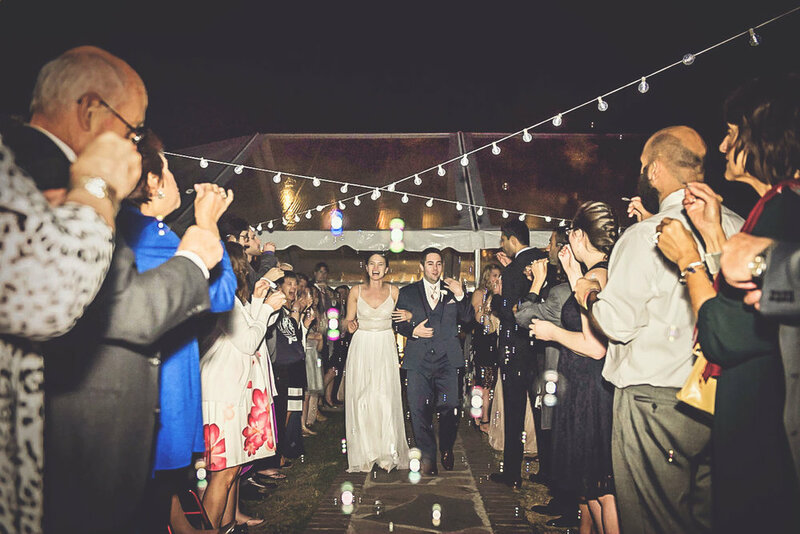 "We didn't tell many people, but my husband and I have so much fun dancing on our own, that we decided to have fun with it and make up our own first dance," remembers Allison.